Congratulations to Mrs. Yunekia Pollard! 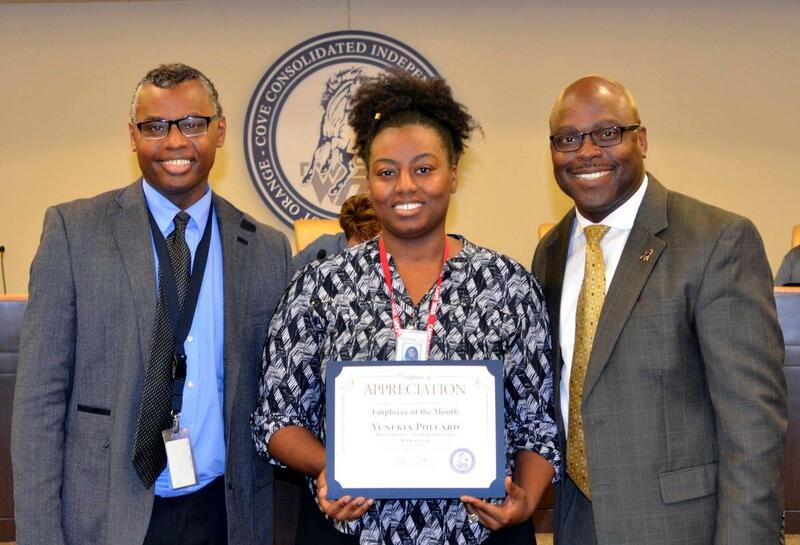 She is the WOCCISD Employee of the Month! Mrs. Pollard is a Math Coach at West Orange - Stark Elementary. Mrs. Pollard is a true team player. She supports students, teachers and campus administrators on a daily basis. Mrs. Pollard assists teachers with planning and creating effective lesson plans to enhance student achievement. What's more, Mrs. Pollard supports all learning goals! Thank you Mrs. Pollard for all that you do! 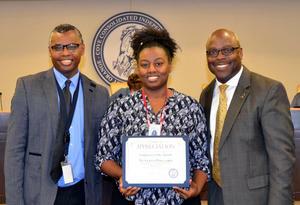 She is pictured receiving her recognition at the WOCCISD Board of Trustee Meeting this week. She is with WOS Elementary Principal Dr. Troy Bethley and Superintendent Dr. Rickie Harris.